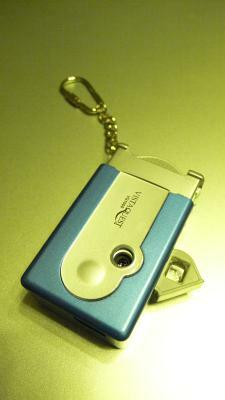 Recently, I reviewed the VistaQuest VQ1005 digital camera. This camera costs only twenty bucks. When I made the product shots, I wanted this camera to look a little more extravagant than its plastic surfaces would show. So I picked a gray silver background, using my wife's notebook computer that happened to be sitting on the table. The gray silver background is the same color as the digital camera and really didn't complement the camera. Plus the two-tone blue and gray camera doesn't make itself stand out. To add some punch to the photos, I decided to play with white balance a bit, rather than using filters and gels. I suppose I was just being lazy. But when I switched to tungsten mode, the warm-colored fluorescent light turned into golden green. It really complemented the blue and really made the digital camera stand out. In order to add a gradual color shift effect to the photos, I have done away with the light tent (actually I was just too lazy to bring out the light tent). Using five fluorescent light bulbs above provided inconsistent shadows that added dimension to the photographs. The shadows also tricked the audiences' eyes in order to add dynamics to the photographs. The direct lighting created a burn spot and provided gradual shift to dark on the edge of the photographs.